Discussion in 'Electrical Codes' started by Scott Taylor, Nov 15, 2017. If this is not the correct place to ask this question referrals are welcome. The International Fire Code prohibits plugging one plug strip into another. No details or reasons given. 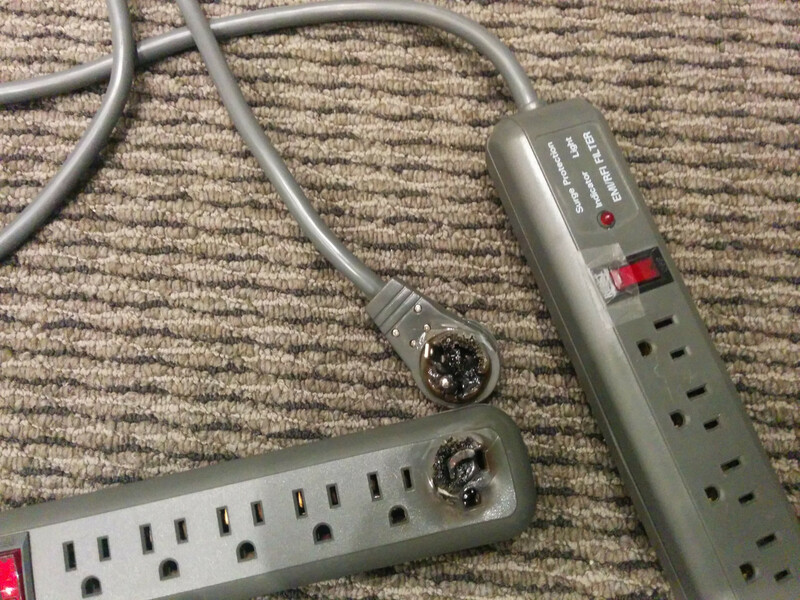 Assuming both cases draw less power than is available from the outlet and that all plug strips are rated for the full power of the outlet, Why is plugging a five outlet strip into another five outlet strip considered unsafe but using a single twelve outlet strip is considered safe? Have you seen the craftsmanship on some of these??? Besides the code saying no, not a good answer. Well gosh Mark, you of all people should know better. Should I choose a different internet picture? Thanks, I have never came across this before when doing inspections, then I looked under my desk, oops, I'll right myself a violation notice and give myself a week to correct, is that okay with you guy's? What happens when the fire happens tonight and you say, the BO said it's okay for a week. What's my liability? Mark I'll take care of it today, got to climb up a stake of pallets and move a desk first to get to the receptacles. I wonder what Kidde's liability is after they announced some of their fire extinguishers don't work when I grab one? Does the recall protect them? BTW, for what it is worth, these "plug Strips" are called relocatable power taps in the NEC...... It also specifically states -... directly into wall. Francis Vineyard and cda like this. There go my Christmas village over the fireplace lights, ouch! Thank you Scott for this topic.